Rewind to about 8 years ago, and I’m not sure I would have known what you were talking about if you mentioned essential oils to me. At that time I was lathering my skin in scented lotions and my hair in scented products, burning candles throughout the house, you name it. I started to become more conscious of what I was putting on my skin several years ago, when a shampoo I was using suddenly caused me to breakout in hives. The hives covered my face and neck and it was weeks before it finally cleared up. I discontinued the use of that shampoo, and started to try to figure out what could have caused the reaction. I started to research the effects things like synthetic fragrances, phthalates, parabens, etc. have on the body. With that knowledge, I could no longer bring myself to lather my body’s largest organ—the skin—in toxins. Everything you put onto your skin, toxic or not, gets absorbed into the bloodstream. Eek! So for me, that meant no more scented lotions, no more perfume, no more crazy scented hair products. Nothing. I also stopped burning candles in the house because they made my eyes red, itchy and watery. My allergies and overall health definitely improved after I cut out the toxic, synthetic fragrances. Although I had a boring-smelling house since everything I was using at that point was of the unscented variety, I went on my merry way. That is until a couple of years ago, when I mentioned to my natural doctor that I had recently been slurring words when speaking and missing letters when writing. He immediately asked if the antiperspirant I used contained Aluminum Zirconium and a couple other things. I had absolutely no idea. I went home, checked the label, and sure enough, the “bad” things he mentioned were on there. I did more research and found out that aluminum zirconium and several other ingredients in antiperspirants have been linked to some pretty nasty illnesses/diseases. I immediately stopped using the antiperspirant and—long story short—began making and selling my own natural deodorant. As I started tweaking my deodorant recipe to find perfection, I began experimenting with essential oils. I had no idea at the time what a huge role they would play in my life. What started out as a fun way to scent my deodorants, has now resulted in creating deodorants with healing powers! Who would have known?! Not only am I now using pure, therapeutic-grade essential oils in my deodorant line, but I use them instead of prescription medications to help control my asthma, anxiety and depression. I use them on my 5-month old to help resolve fussiness, congestion and coughs, as well as for diaper rash prevention. I have also begun using them in place of toxic household cleaning products which is incredibly important to me especially with a little one about to start crawling on the floor! And I can’t forget to mention that I’ve finally found something to help “scent” my house that won’t kill me! Goodbye “Glade Plug-Ins”! Did you know that those things are filled with formaldehyde—the biggest chemical carcinogen that we know of? Did you know the formaldehyde in there actually deadens your olfactory nerves? That’s why you stop smelling it after a while and have to switch scents! Terrible! 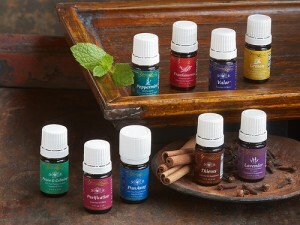 There are so many more uses for essential oils, I am so excited to explore the myriad of possibilities of what EOs can do for myself, my family and my friends! Expect more info coming your way soon, and if you’re interested in purchasing pure, therapeutic-grade essential oils, I do so through Young Living. Feel free to message me for more information, but the best way to experience EOs is to purchase the Premium Starter Kit, which gets you a TON of oils as well as the diffuser, which is muy importante, for a super awesome price.